From time immemorial human beings were aware of the environment; or it could well be argued that as the humans started thinking about the environment the human cultures began taking shape. Observing the things and events around him objectively and then contemplating on it subjectively he could find the interdependence and interrelationship of each and everything both at physical and metaphysical levels. Each has its own separate qualities and distinct existence. The shape, colour, texture and all other physical qualities of each on made him feel the diverse manifections in nature. The informatiion made ‘science’ and ‘art’ grow spontaneously in the beginning as these both intellectual expressions were ‘activities’ at the same time. As humans started attributing surplus meaning to things cognised, the horizon of human thought and imagination got widened. The nature around him acted as a catalyst to make him reflect upon the environment, climate, plants, water, air, sky, sun, moon, life, death and almost all the apparent dichotemies. The unlikeness and the multiformality of the outer appearance of things made him feel the function of everything as well as its ‘beyond functional’ expression. The audio-visual space relation with respect to time actually made him feel the aesthetic rhythm and balance of physical and metaphysical existence of everything in the context of ‘All knowledge’. The philosophical demension of abstract human thought began to theorise the information received through the senses. The sense and sensibilty in him made the world more significant for him who could enhance the quality of life not only of himself but the whole society and the very concept of life of everything around. In this process states of consciousness along with the logical faculty create a condition for creativity. Here intellectual, emotional and volitional functions are brought into play together. There is always a realistic encounter; and along with that, intense absorption involvement, commitment and heightened consciousness also are prominent. In that process opposite, contradictory and antithetical concepts/images are confronted simultaneously. This confrontation becomes awareness about diversity which has local specificity also. Each country or place has its own colour sensibility which is totally related to nature. The wind creates wave patterns in the sand of Mesopotamia which is a desert where the mirage is an illusion and hence symbol of desire, though futile. The earnest longing for water and flora in a desert is understandable and naturally the motif of wish of that culture becomes green in colour. The void latent in their wish is filled with the chromatic expression in ‘green’ there; it is the sign of quenching the physical as well as aesthetic thirst. On the other hand the nature in Kerala reflects an abundance of green with its all embracing canopy of green trees. 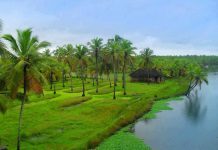 The fertile land of Kerala is a green rich terrain whose colour of fruition both materially and culturally, is red or yellow or some tones of either of these. The flowers and fruits generally are the tones of these two colours, and it becomes the colour of wish and wealth of Kerala. Red is again significant when the fertility of the human feminity is regarded. Fertility cycle is denoted by red colour code in natural rhythm of season too. Fertility rites are practised in almost all tribes with elaborate ceremonies. Blood is a symbol of creation and death, Kali, the primordial mother concept is the goddess of creation and destruction. In the past, Kerala had groves connected with the concept of mother goddess who is the ideity of both creation and destruction. Earth is worshipped as mother from whom the plants sprout, and mother earth gets angry when earth is polluted by the demon Darika. All other parts of India also has this myth where the demon is Mahisha and the goddess is Mahishasuramardini, who here is Darika Annihilator. 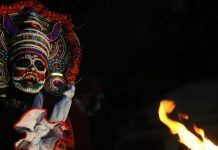 The demon Darika is not popular in other parts of the country and all the mother -goddess myths of Kerala are connected with Kali-Darika fight. Two faces/moods of Kali are present, one the ferocious Darika Annihilator and the other, the affectionate mother who is creator. In annihilation the blood of wrath is spilled and in creation the blood of affection; the same material with the same colour depicts the polar opposites of existence, or rather these opposities are accepted as the inevitable dichotomy of being. The worship of Kali is always connected with the colour red. The red garment, red garland and the blood-like liquid prepared by mixing lime and turmeric to simulate blood sacrifice to mother are always seen. The ‘Bloody Sacrifice’ to propitiate the angry goddess is a mythical ritual performed even today in Bhadrakali Kavu. kali who bathed in red/blood in creation did the same in the destruction of evil; Rudhira Mahakali is the common concept in Kerala connected with mother-goddess worship. The moral and ethical aspects of the society and also the mythical jurisprudence are encoded in this ancient narration which still is kept alive through a number of art forms. Though not accepted as a proved truth that there was human sacrifice in the primitive society of Kerala, there was a belief that it was practised. And even if it was not practised, the concept of a bloody sacrifice could be there in the collective consciousness of the society and it became a mythical motif. From human sacrifice to animal sacrifice and from there to a ‘motif’ it follows an evolution. All the art forms connected with the mother goddess concept have the dichotomy of death and birth, not only of physical nature, but of cultural nature also. The cyclic phenomenon inherent in these concepts are temporal and spatial. Everything happens in human life between the two polar opposities of life and death; festivities, daily life, sowing, harvesting, falling ill, failure and success etc. are the ‘filling agents’ of the space and time between life and death. Almost all rituals in Kerala are connected with agricultural practices and have some kinds of visuals as accompanying props whose colour is yellow or red, or tones of these two. 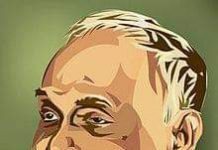 Kuruthola, Kodimundu, Kasavumundu, Chandanam, Manjal, Pichala Vilakku, Theenalam, Nirapara, Pookula, Swarnam, Nettipattom, Kanikkonna, Kanivellari, Vaalkannadi, Thaaliyola etc. have tones of yellow. The colour of most of the fruits is yellow or some shades of yellow/red. The human mind that observed nature found out the process of ripening of fruits in terms of yellow colour. The wish of the mind to see everything in terms of colour is an intellectual activity connected with culture. Vincent Van Gogh’s use of very rich yellow colour is studied psychologically, aesthetically and culturally. In the west also the colour of wealth was yellow. Sky/heaven was considered to be yellow in colour and artists followed this almost like a formula till Giotto who was considered to be the pioneer of the Renaissance painting, the main characteristic of which was illusion of reality. Hence from that period onwards the ideal colour of heavenly wish was changed from yellow to blue. For the aristocrats, to show their superiority over the commons, the ‘conceptual colour’ of blood was blue, that became a symbol of contempt during French Revolution. Red became the synonym of the common man and proletariat; later socialism and communism accepted red as their colour symbol. Common people of Kerala had only white colour for their dress which was just a loin cloth both for men and women, while the costumes for the performance had prominence of red. Though people of north India, especially Rajasthan used to wear white, but elaborately decorated with embroidery. Lord Siva is blue in iconographical concept all over India or he is least Blue-necked (Neela Kanta) whose neck is more bluish than the rest of the body. All over India Lord Siva is painted blue. Siva, though blue or blue-black becomes white by smearing the white ash from the cremation ground all over the body, and so he is white in traditional mural paintings of Kerala; but in the theme Sakthipanchakshari, Siva is golden yellow to show the auspicious union of lord with goddess Sakti/Parvati. The iconography connected with high myth is regionally changed here according to the aesthetic dogmas of a locally specific culture. 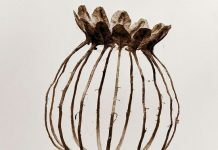 ‘Universally’ accepted norms are often not followed in folklore/folk art as the people connected with these use their language of expression according to their needs, perspective, ways of seeing, availability of materials etc. They are satisfied with what they have; they manipulate everything for what they need which is limited, harmless to oneself and others and confined to the humble necessities. When Siva was depicted white, Krishna, though blue all over the country, was portrayed green in the traditional Kerala mural paintings. In the traditional mural and floor pictures the artists use only five colours namely red, yellow, white, green and black. The high myths may have Krishna blue in colour but the indigenous formula connected with painting brought the high myth down to suit the colour prescriptions of the local artists. In Kathakali Siva is face painted off-white/golden yellow. Here one question may be raised whether Kerala mural paintings or Kathakali can be called ‘folk’, are they not classical? Any classical art has taken a number of factors from folk. It is not the classical that was born first; they are the derived and refined (Samskrita/Sanskritised/made elite) forms derived, improvised and theorised. But Siva and Krishna got a chromatic change in the field of indigenous paintings in Kerala where they are brought down from ‘high’ myth to ‘low’ to suit the indigenous aesthetic concept. Local specificity is not only in flora and fauna or in climate, but there in cultural signs also. Kerala is (?was) full of green and the artists accepted it as a sign of growth/infinity which is nature itself. The flowering and fruition of nature is yellow or red in colour. The Day’s can be interpreted in chromatic terms as black and white. The sun rise and the sun set are the two natural events one experiences every day, and the transition period Sandhya on both the occasions is having colours red and yellow or tones of both of them. The whole day can be chromatically seen as black and white with yellow/red tones in between. The surroundings have the colour green. The whole nature is chromatically interpreted and the same colours are used to suit the aesthetic pursuit of the mind. 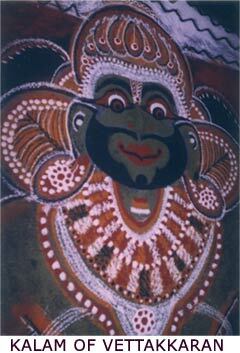 Kerala is a region where the mother goddess Kali is worshipped whose complexion is ‘black’. It is from her (black/night) the day (white) dawns and it is to her (black/darkness/night) the day (white) surrenders. During night she protects her children who can hear only the voice of nature. 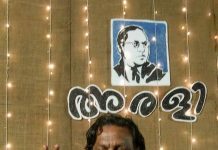 To appease her, different regions of Kerala have different performances especially during night time connected with the myth of Kali-Darika confrontation. Many performances such as Mudiyettu, Padayani, Paranettu etc, are connected with this myth, and many Theyyams are connected with local history, legend or hero worship. The face painting and floor pictures connected with the performance also have only five colours. The ‘theatre’ of the performance is illuminated with the help of fire lamps both fixed and carried in hands, in the flames of which the characters dance in tune with the songs and to the beatings of the rough percussion instruments. The wilderness of colour, flame, music and rhythmic beating make the whole atmosphere something supernatural. The magical spell of the atmosphere is connected with the chromatic formula of the indigenous culture also. Along with the cultural aspects of colour, one has to think about the optical/sensory quality of it also. It has physical and emotional dimensions. Colours having various wavelengths can create different moods. warm colours such as red and yellow can certainly create an emotional upsurge that is stronger than the so called neutral ones such as grey and white can give. 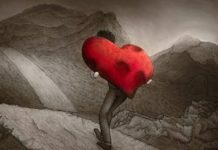 Though the emotional aspects are felt and recorded the real nature of colour in relation to feelings, moods and emotions are not yet satisfactorily explained in terms of culture. Sometimes it is more psychological than optical, and also more subjective than objective. We can think of colour connected only with some objects such as red of the blood, blue of the sky, green of the leaf etc. Taking the abstract quality of a colour (eg. redness of red) one can be led to a situation where the colour can be disconnected with the object intellectually. Research on the effect of colour on our nervous system and its consequent evocation of feeling/mood shows that it is abstract, subjective and almost ‘beyond explanation’ at an empirical level. The limit of seeing colour beyond ‘violet-red’ spectrum by human retina is to be taken into consideration when we analyse and explain the ‘meaning’ of colour. It is pertaining only to the human visual sensory faculty. Different tones of various colours give subtle changes of feelings in human mind, as all visual appearance is producted by colour and brightness. The ability of the eye to differentiate areas of colour and tones give the impressiion about the dimensions of the object. Three dimensional shapes of the performing forms are defined emotionally and spatially in the dark because of the brightness of flame which is reddish or yellowish. Shapes enable us to distinguish things and get an awareness of performing characters, but colour also helps considerably. Black and White alone cannot give a sensation, but the tones of other colours combined can create an integrated sense of the ‘total theatre’. When he factors of the rituals are culturally and emotionally approached with its own rationalism it communicates the ‘civilisation’ oif the community. Colour is signal, sign, graph and a strong means of cultural communication. Difference in people’s reaction to colour are studied in psychological experiments. More than the individual psychology the collective consciousness of the people of a regional and indigenous culture creates identifications of the society in every aspect. An agrarian culture obviously is attracted to green, yellow and red as a subconscious extension of their daily experience and means of living. Rituals cannot be separated from these experiences as they are the manifestations of culture. Experience of colour has emotional and cultural values. It presupposes a kind of openness because colour is more ‘sbstract’ than shape, and hence colour can create a more ‘metaphysical’ nature of culture than shape. It depends on the social/cultural/individual mood of the collective mind. Actively organised collective mind of the society automatically attributes meanings to colour in all cultures. The correlation between colour, regional peculiarities, fantasies, wish fulfillment and the political control can reveal the structure of the society. Usage of minimum or limited colours such as the five colours in Kerala is the sign also of the economy of the society which is agrarian. The people here had a very humble attitude towards life, nature and human relations. The society schematises colour which can cultivate and enrich the spirit of the society. For this purpose rituals and art forms are used. If songs are the voices of culture, colours are the spirit of the society latent in an abstract sense. Abstration is a derived and generalised one taken from many things seen around. Yellow is an abstract colour of prosperity and wealth derived from things taken from the spirit of the agrarian society where fruition is the ambition of the people. Here the adoption of colour is from association of things with concepts of natural phenomena. ‘Cultural colour’ is the product of generalisation, and it can express the dynamics of the society. ‘Cultural Colour’ stands for the quest for the harmony of a society. The sense of colour composition of a society and its art forms are connected with the hidden structure of the society. It is intuitive, intellectual, ecological, regional, cultural, objective and subjective. Always the appearance and expression of colour are modified by the culture. It is the activity of integrated sense of the society. The traditional indigenous five colours of Kerala are the natural manifestation of the basic elements of culture. 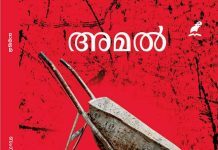 As the situations and cultural contexts changed the colour sense of Kerala also changed subsequently. It became an unlimited multichromatic leaving the five colour formula from the late 19th century onwards. Naturally the culture reformation and rebellious perspectives towards the rotten socialk practices prevalent here then changed the colour sense also. The horizon of thought got extended and hence its reflection is felt everywhere.